That was easy. For Celtic Solstice, I spent time cutting yesterday. I did a fail. But thought I was so cool. I need more blue triangles so I went through my various bins for blue fabric. I started with Bin #3… If you don’t remember, Bin #3 was fabric scraps that were less than 5×7. You can see the details in the bottom of this post. I actually found a couple of bits to use. Then I went through Bin #4 and found a bit more blue fabric. But I still didn’t have enough so I went through the yardage bins! And since I had pulled them out sorted through them so that they were in color ways. I was able to get all the blues in one bin. It was a nice process and I felt reacquainted with my stash again. I petted the beautiful fabrics. I also recognize that in the blue bin, I’ve got way too many mediums and a lot of neutrals. But not a ton of dark. So, if I get the urge to buy fabric, its nice to know what to add to the stash rather than just go buy willy nilly. Why was that a fail? Well, I realized after I pressed and cut all the needed triangles, it hit me that I pulled all the fabric I needed for Celtic Solstice and put it in its own project bin. So I looked in the bin and confirmed I had a lot more blue fabric in the bin waiting for me to retrieve. I didn’t need to do everything I did and spend a lot of quilting time (read: the whole day) looking for blue fabric On a positive note, I got to take my fabric out, let it breathe as I sorted through them and petted them before putting them back into bins. And they are divided in general color ways – Blue, Red/orange/yellow, green/purple/rainbow/panels, white/black/grey! I don’t need more fabric, I’m trying to lay low at the LQS but, let’s be real, you know the urge will come so it’s nice to know what I should get to enhance my stash. 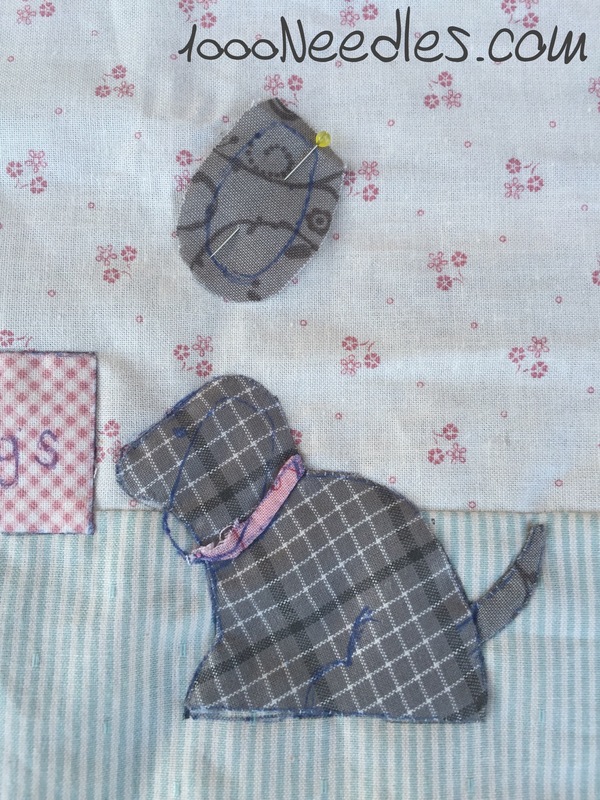 I didn’t have a chance to applique the ear on the dog last week for Raining Cats and Dogs – so that’s still on the to do list. But, my mojo is on finishing step 5 of Celtic Solstice so it may just stay in it’s little cubby hole until my mojo swerves back to this little puppy! It’s okay that you did all that – you organized, and you now are more familiar with what’s in there! Thanks for linking up and contributing to a wonderful Slow Sunday Stitching!